That was four long years ago, and the young Mantecan returned on Saturday to win on the quarter-mile asphalt track. Gomes, 16, took the lead with five laps to go in the NASCAR Western Late Model main event and claimed a stunning victory - his first as a WLM driver - at Stockton 99. 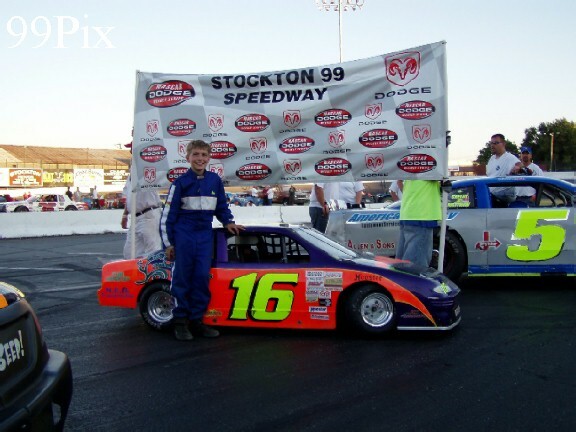 He was racing in the Mini Cup class the last time he won at Stockton. Gomes jumped out of his car and hugged his crew and family after doing a few donuts. "This is just amazing," #16, Gomes said. "My crew just did their best to set up the car, and they were great." Gomes said the track improved as the day and night went on, which echoed the sentiments of most competitors. Track promoter Tony Noceti had the track repaved on Tuesday to repair cracks and other issues. The project cost about $120,000. No practice was allowed until Saturday, when race teams were given an extra two hours to adjust the cars. "It's beautiful, so smooth, but it was pretty tough early," said veteran driver #12, Greg Potts of Stockton, who finished third in the WLM race. Danny Contessotto of Stockton said the problem was the absence of racing grooves. "It was challenging, but you could see it getting better as we put some laps on it," Contessotto said. "It kept getting faster." Potts had the lead on lap 45 when Gomes gave him a little bump and swung past the track veteran to take the lead. Justin Philpott of Tracy was second, followed by Potts, Todd Corral, #16 and WLM points leader Vito Ranuio, #27, of Stockton, who was the fast qualifier at 14.373 seconds. Aaron Coonfield, #25, of Riverbank won his third Street Stock main event, continuing the success he had on the old surface. "It was fast but a little loose," Coonfield said. "It will only get better." Jason Philpot, #15a, of Sacramento won his first Grand American Modified main event at the track, and #22, Ben Lewis II won the Bombers race. After a week of anticipation, on May 16th, the earth trembled once again as the NASCAR Whelen All-American Racing Series rolled, anxiously, onto the new racing surface with expectations of grandeur. Goodyear Night with Penney Racing Supply presenting The Hard Charger Award came to life under sunny skies and even sunnier dispositions. Included on the ticket for the event was the NASCAR Whelen All-American Western Late Models, Grand American Modifieds, and, fresh back from a two week break, the ALSC/Street Stock Division returned to action with the Bombers rounding out the card. NASCAR Whelen All-American Western Late Model action started out not quite as smooth as the new surface. Carlos Viera, in his Race for Autism #51 machine, started on pole and secured that much coveted top spot until the #86 of Tim Spurgeon, spun on lap 3 bringing out the first yellow of the race. After further review, Dash Winner, Joey Stearns (8) of Stockton, was put to the back for spinning Spurgeon. For safety reasons due to the new asphalt, all restarts were single file, and on the restart, Viera pulled ahead only to be slowed by a quick caution on lap 5 when Justin Philpott (05), and the #78 of Rodney Funston, got together between turns one and two. Unfortunately, defending WLM Champion, Guy Guibor (61) of Manteca, had no place to go and was caught up in the wreck which sent him to the pits and ended his evening. Viera led the field to the green on the restart with intense pressure from the #12 of Greg Potts for the next 30 laps. On lap 35, Viera’s car jumped out from underneath him coming out of two and spun in front of the field drawing the third caution of the race. Potts inherited the lead due to Viera’s misfortune and held on until lap 46 when 16 year old sensation, Jake Gomes (16x), gave Potts a little nudge coming off turn four and took the lead to the checkers for his first career Late Model victory. “This is amazing,” said the young Gomes, “My crew did a great job setting up the car for me.” The race was plagued by four cautions, none which seemed to have anything to do with the new surface. Philpott rebounded from the lap 5 incident to finish second while Potts fell back to third, Todd Corral (16) of Modesto followed in fourth, and Points Leader, Vito Ranuio (27) of Modesto, came back to finish a strong fifth. Matt Erikson (42) picked up the Hard Charger Award presented by Penny Racing Supply. The Grand American Modified Division took to the asphalt in anticipation of what promised to be white-knuckled, extremely fast racing on the newly repaved surface. Larry Tankersley (96) of Stockton, and the #21 of Benny Moon, brought the field to the stripe with Tankersley grabbing the lead on lap 1. The #1 of Todd Lynch moved quickly to second with a tight battle for the lead ensuing. By lap 4, Jason Philpot (15a) of Sacramento, starting fifth on the night, had worked his way through the field to challenge the #96 for the lead. On lap 5, Philpot dove below Tankersley coming out of four and pulled away to his first victory of the year and the first on the new pavement. Fast Qualifier and Dash Winner, Wes Miller (57a) of Turlock, made his way to second from the sixth position, but ran out time to do anything with Philpot. Lynch would hold on to finish third with Points Leader, Michael Ostrowski (#17), coming home fourth, and for finishing fifth, Larry Tankersley was awarded $100 from Off Road Enterprises. Also, AJ Rider (62) of Stockton, took home the Hard Charger Award presented by Penny Racing Supply. After a two week rest, the ALSC/Street Stocks roared back into action in their 40 lap Main Event. This Division is still in its developmental stages, but the racing tonight proved anything but a new class. First-timer, Mel Wilson, in his #2 Camaro, and Kannai Scantlen (8) of Valley Springs, brought the field to the green with Scantlen jumping out to an early lead. The #8 would hold onto the lead for the first 13 circuits before relinquishing it to Fast Time and Dash Winner, Sammy Solari (79) of Salida, coming out of turn two down the backstretch on lap 14 with the #25 of Aaron Coonfield, sliding in line behind him. 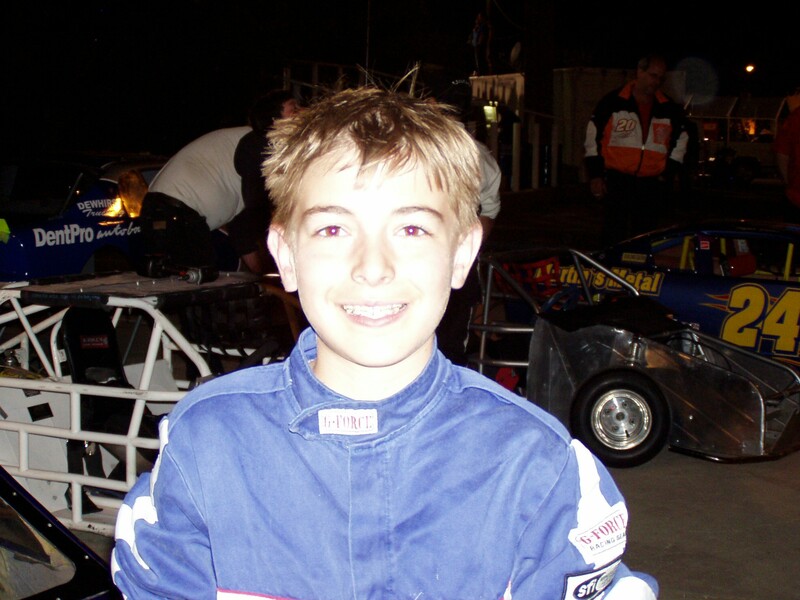 Coonfield stayed close to the Solari’s bumper for the next 18 laps, but on lap 32, Coonfield slid by to take the point and cruised to his second win in a row and third on the season. “It was slippery out there all day, but it was fast,” Coonfield said, “I think it’s only going to get better.” After bringing out the first and only caution of the night, Solari headed to the pits with engine woes which inevitably ended his night. Mr. Consistency, Pete Anderson Sr. (85) of Stockton, finished a half second behind in the two spot with Scantlen slipping back to finish third. Points Leader, #31, Jeff Ahl came around in fourth, and Mel Wilson made up the top five. For finishing sixth, Chad Holman (75) of Valley Springs, was awarded $100 from Off Road Enterprises, and the #1 of Don McLaren collected the Hard Charger Award presented by Penny Racing Supply. The Bombers took it to the main stage for the second race of the evening. Points Leader, Ben Lewis ll (22) of Stockton, started fourth on the field, but by lap 1, he grabbed the lead and never looked back to win his fifth race in a row. Tom Dahl (4) of Stockton, just off a Heat Race win earlier in the evening, crossed the line in second ahead of Russell Johnson Jr (5) of Stockton, with Brandon Jones in the #33 finishing fourth and the #6T9R of John Ekas in the fifth spot. Remember, next week, Saturday, May 23rd, California Welding Supply Co. presents The 2009 Tri-Holiday Classic Race Series #1. Don’t miss out on some great racing action as NASCAR Whelen all-American Western Late Models run 150 Laps. Also on the card for the night, Grand American Modifieds in their 75 Lap Main Event with the ALSC/Street Stocks putting 60 Laps to the asphalt, and the Bombers going for 40 Laps.